Three weeks ago, some unremarkable local weather site that shall go nameless made the following prediction: That Houston had had its last 90-degree day of 2018. And that prediction seemed pretty safe until Tuesday—when by early afternoon the high temperature had reached 88 degrees. Fortunately for that unnamed site, the high temperature stopped there, and didn’t tick a bit higher. (If it had reached 90 degrees, it would have set a record for the city’s latest 90-degree day in a calendar week by more than a week). Anyway, Tuesday sure was warm for early November. And we’ll have one more warm day today before a prolonged cool period begins. It’s also worth noting that the weekend now carries rain chances, whereas before it looked mostly dry. A very weak cold front will push into the region today, and should serve as the impetus for some showers and thunderstorms. 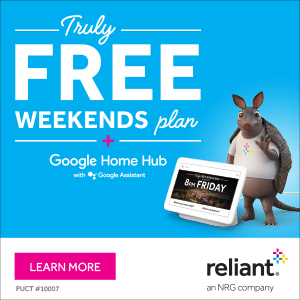 These are probably the kinds of storms where one or two relatively isolated areas in the Houston region pick up 2 inches of rain—and some hail is possible within the more intense storms—but most of the area sees no rain, or a few tenths of an inch. Skies will be mostly cloudy, and this should limit highs to the low- to mid-80s, rather than the upper 80s we saw on Tuesday. Lows should fall into the 60s tonight, except for the coast which will remain warmer. Highs will be more seasonable, in the mid-70s for the most part. Scattered showers will be possible throughout the day, but rain chances are probably only in the 30 to 50 percent range for most of the area, with the greater action coming during the overnight hours, with the approach and passage of a stronger cold front. Rain chances will jump up to the 70 to 80 percent range by around sunset Thursday. The combination of high moisture levels and lift from the front will allow showers and thunderstorms to develop along with the front. In terms of accumulations, we expect between 0.5 and 1.5 inches for inland areas, and 1.0 to 2.0 inches for regions closer to the coast. Of course there probably will be higher amounts in some locations. They will linger through much of Friday. 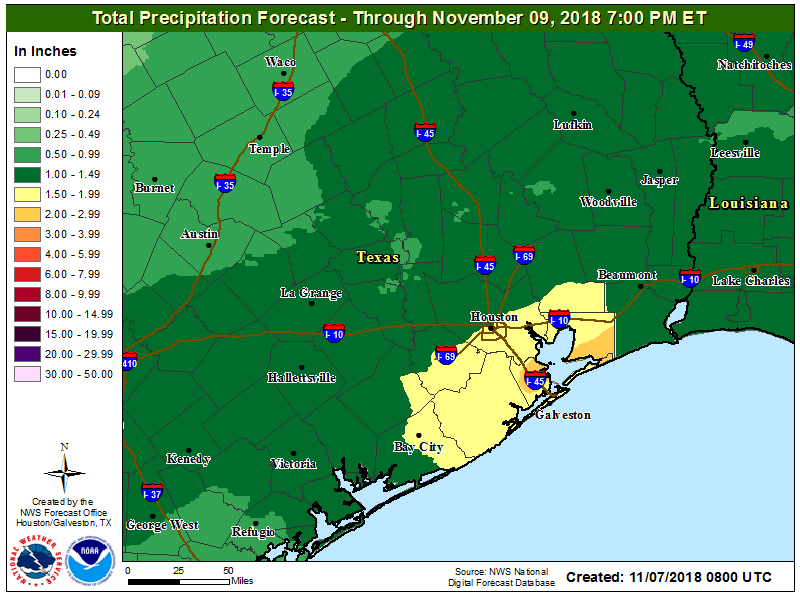 As far as timing, it appears as though the front will reach northern areas around midnight, push through central Houston during the wee hours, and be at or off the coast by around sunrise on Friday. The wind shift will be noticeable, with northerly gusts in the low 20s likely on Friday during the day. With highs only in the 50s, this will be a damp, gray, and cold affair for the city. Rain chances fall back by Friday evening. What once looked to be a dry, sunny weekend now appears to be less so. 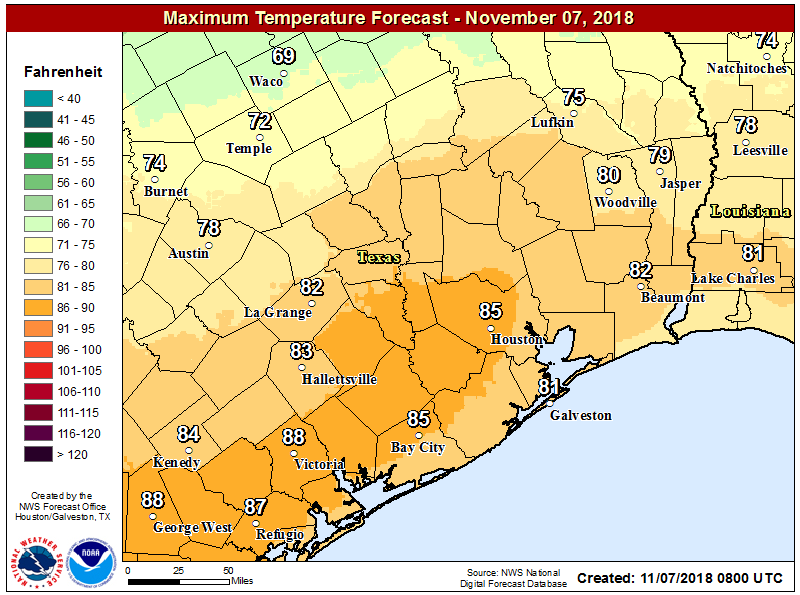 We remain confident in the temperature forecast: Daily highs should be around 60 degrees (or just below), with overnight lows in the low 40s for far inland area, upper 40s in Houston, and 50s along the coast. However, skies will likely remain partly to mostly cloudy on both Saturday and Sunday, as low pressure lingers offshore, and this could spin some moisture back toward the Texas coast over the weekend. Rain chances will be low on Saturday, probably in the 10 to 20 percent range, but could jump up to 30 to 40 percent on Sunday. For those with outdoor plans on Sunday, it would behoove you to at least consider a back-up option. 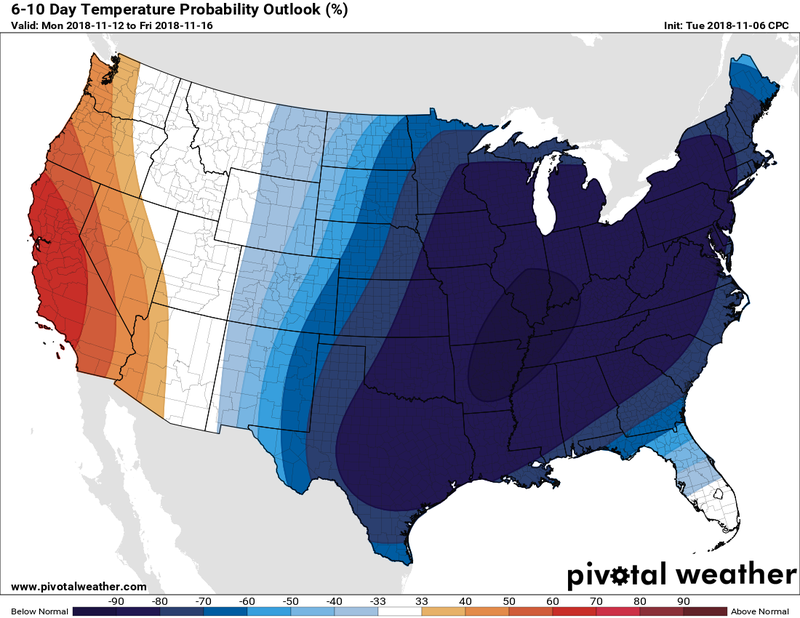 High temperatures will likely remain in the 50s through Wednesday of next week as an atmospheric highway for cold air opens from Canada down into the United States. Reminder: Our annual fundraiser is ongoing. We’re selling t-shirts (with some killer designs), umbrellas, and accepting donations. Thanks for considering! I can neither confirm nor deny this happened. The Secretary will disavow any knowledge of your purported actions. Clearly you have that totally backwards. Well drinking the 5th at work could get you fired! Depends on when and where one drinks the 5th. doing so at work could get you fired. Congratulations to you and your bride!!! Have a fantastic day! Eric and Matt Fatheads decals? The descriptions of the shirts sound really cool, but the designs are all the same. Am I missing something? You’re missing the back side. There’s a little button you can click to view the back. Guys-Tell the folks at that “unremarkable local weather site” that all is forgiven for their 90-degree prediction of three weeks ago. Had that information come from a “remarkable” weather site ending in 2, 11, 13, or 26, viewers would have been put on alert to stock up on extra water, to hunker down in the coldest room in our homes, or in the case of the city of Katy, to prepare for immediate evacuation to mountainous, cooler elevations. Oh, the horrors! In short, it ain’t no big deal. Thanks for keepin’ H-town weather on the real and for not scaring us into a flight to Colorado to save ourselves from a horrible scorcher!!!! 87 degrees and rising at the plant…. Eric better get up to IAH with a hose and tanker truck…. Eric is sooooo smart. He made it rain here to cool things off. No need for him to drive to the Ship Channel! I feel bad for folks who haven’t found Space City Weather. Not only are they missing out on the no-nonsense and (usually) accurate weather forecasts but the surprising dry humor often woven into the daily posts which usually makes me LOL! So glad I found you guys during Harvey. Keep up the great work.